My article for CNET News.com this morning analyzes the “leaked” net neutrality bill from Rep. Henry Waxman, chair of the House Energy and Commerce Committee. I put leaked in quotes because so many sources came up with this document yesterday that its escape from the secrecy of the legislative process hardly seems dramatic. Reporters with sources inside Waxman’s office, including The Hill and The Washington Post, expect Waxman to introduce the bill sometime this week. The CNET article goes through the bill in some detail, and I won’t duplicate the analysis here. It is a relatively short piece of legislation that makes limited changes to Title I of the Communications Act, giving the FCC only the authority it needs to implement “core” regulations that would allow the agency to enforce violations of the open Internet principles. The Waxman draft would sunset at the end of 2012. And it asks the FCC to report to Congress sooner than that if any additional provisions are required to implement key features of the National Broadband Plan, which has sadly been lost to the tempest-in-a-teapot wrangling over net neutrality before and since it was published. Many commentators who are already condemning Waxman for selling out “real” net neutrality are upset over provisions—including the sensible call for case-by-case adjudication of complaints rather than the fool’s errand of developing detailed rules and regulations in advance—that appear in all three documents. They either don’t know or don’t care that in that regard Waxman’s bill breaks no new ground. 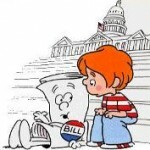 Where the bill differs most is its treatment of wireless broadband. The FCC’s October NPRM, albeit with reservations, ultimately concluded that wireless should not be treated any differently than wireline broadband. Google-Verizon reached the opposite conclusion, encouraging lawmakers to leave wireless broadband out of any new rules, at least until the market and the infrastructure that supports it become more stable. Waxman’s draft calls for limited application of the rules to wireless broadband, in particular prohibiting carriers from blocking applications that compete with their voice or video offerings. But it isn’t clear if that prohibition refers to voice or video offerings over wireless broadband or extends to products (digital voice, FIOS, UVerse) that the wireless carriers offer on their wireline infrastructures. And the draft also carves out an exception to that rule for app stores, meaning carriers can still control what apps its customers download onto their wireless devices based on whatever criteria (performance, politics, prudery) the app store operator uses. If net neutrality needs federal legislation and federal enforcement (it does not), then this bill is certainly not the worst way to go about it. The draft shows considerable evidence of horse-trading and of multiple cooks in the kitchen, leaves confusing holes and open questions, and, so far, doesn’t even have a name. But at least it explicitly takes Title II reclassification of broadband Internet access, the worst idea to surface in the course of this multi-year debate, off the table. Beyond the text, in other words, is the shadow theater. Why is Waxman, a strong net neutrality supporter, leading the charge for a bill that gives up much of what the most extreme elements have demanded? (Watch for the inevitable condemnation of Waxman that will follow the introduction of the bill, and for Tea Party opposition to any Republican support for it.) Why has FCC Chairman Julius Genachowski expressed appreciation that Congress is working on a solution, when his own agency has in theory already developed the necessary record to proceed? Why introduce a bill so close to adjournment, with election results so uncertain? I have my theories, as does every other policy analyst who covers the net neutrality beat. But predicting what will happen in politics, as opposed to technology, is a losing proposition. So I’ll just keep watching, and trying to point out the most egregious misstatements of fact along the way.